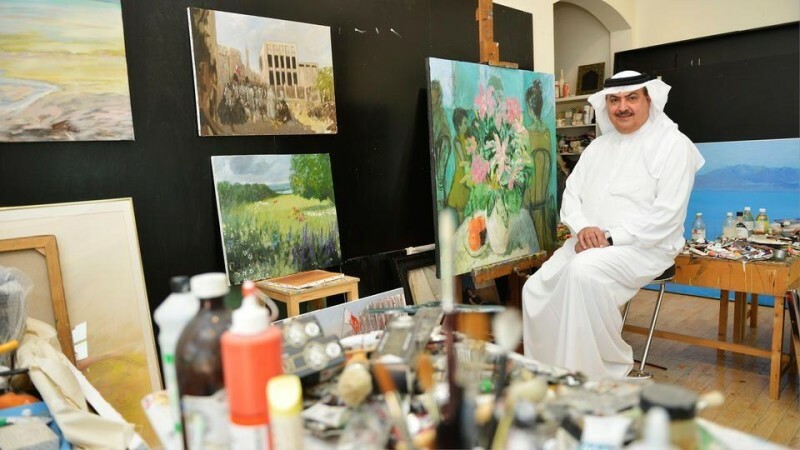 Sheikh Rashid in his art studio in Bahrain. On his easel is Together. 2016. Oil on canvas. 100 x 100cm. Step inside Sheikh Rashid's art studio and you'll find a scene typical of any artist at work: a mix of brightly coloured oils and acrylics lie on a palette amidst an array of various sized paintbrushes while nearby is an easel with a fresh layer of paint. Art books, catalogues and sketching paper surround the scene in a warm fashion; this is where artistic creation is born. And while a common scene of artistic frenzy can be expected on any studio visit, what differs here is the sheer diversity of Sheikh Rashid's work as well as the sense of calmness that permeates the space. From landscapes to pure abstraction and realistic portrayals of historical and present day Bahrain-Sheikh Rashid's plethora of work touches upon a multifaceted use of different media to reveal at once the philosophic and emotional inherent in a work of art. Born on the desert island of Bahrain, the luminous sandy landscape that pervades the Gulf region is an endless source of inspiration for Sheikh Rashid. And it's here amidst that the never-ending sand dunes-with their multitude of layers, forms and also hues-that the artist finds embraces his love for harmonious colours and forms. "I have here a mix of different periods of my art," he says. "I work on a number of different paintings and artworks at the same time. This gives me time to reflect. I see that if I leave something for a while then I can identify when I go back-sometimes weeks, months, and even years-what the problems are." Sheikh Rashid explains how the gradual development of his oeuvre saw him go from landscapes to landscapes mixed with figures and also still-lifes, "they all merge like the three elements, like life," he notes. One can easily strike parallel's to Barnett Newman's monumental Colour Field Painting in Sheikh Rashid's large canvases with blocks of divided colours or Abstract Expressionism in his figurative landscapes-many of which were made during the 1990s and observe a harmonious confluence of colours and forms that verge between the human and the abstract. Recent contemporary work incorporates materials such as aluminium and steel in artworks that single out the circular shape and its multitude of artistic possibilities. A leading figure in the Bahrain art scene, Sheikh Rashid is the president of the Bahrain Arts Society and founder of Art Bahrain. He also recently initiated Royal Bridges, an initiative that promotes the discovery of members of royal families across the world as artists in their own right-distinct from their wealth. A member of the Bahraini royal family, the project will display his work as well as that of nine other artists from regal backgrounds in Convergence, a one-day public exhibition in Dubai on 30 November. "Royal Bridges links the Middle East with the rest of the world," he says. "The platform encourages great awareness and appreciation of art." Showcased will be a range of paintings, sculpture and performance, from artists such as Sheikh Dr Hassan bin Mohammed bin Ali Al Thani from Qatar, Saudi Princess Reem Al Faisal, Rostislav Rostislavovich Romanov of Russia and Lelli de Orleans e Bragança of Brazil, the latter who are descendants of former royal families. On the evening of the exhibition, Christie's Middle East will support the initiative through an auction of the exhibited artwork of which the proceeds will be donated to the World Food Programme. As in Sheikh Rashid's art and various artistic initiatives, Royal Bridges promotes community development through creativity. Here artistic ability and humanity go hand-in-hand in the same humble and visionary way in which Sheikh Rashid lives his life and his art.